Story: The fantastical adventure kicks off when Larry Daley (Ben Stiller), a down-and-out dreamer whose imaginative ideas have never paid off, finds himself in desperate need of a job. Larry has always believed he was destined for big things. But he has no idea just how literally gargantuan and hairy a challenge he will face when he grudgingly accepts the supposedly menial graveyard shift as a security guard at the Natural History Museum. 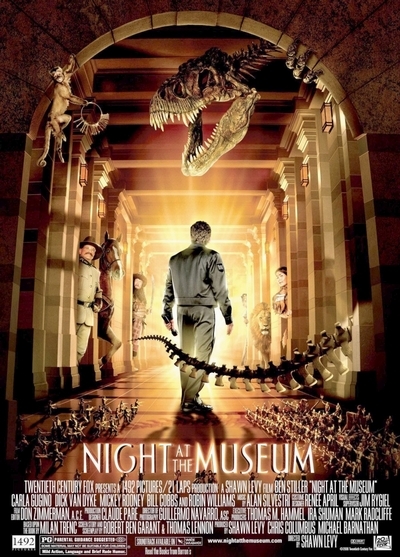 On his very first night on the job, Larry is handed an over-sized flashlight and a dog-eared instruction manual, then left all alone in the eerily quiet, cavernous museum. At least, he thinks he's alone. But wait, what's that noise? To his utter astonishment and disbelief, Larry watches in shock and awe as, one by one, the primeval beasts and storied icons that surround him stir magically to life - and total havoc ensues. Now, as Tyrannosaurus Rex and Attila The Hun carve a swath of destruction through the marble corridors, and lions and monkeys prowl the fragile exhibits, Larry is at a loss as to how to get the museum back under control. At his wit's end, Larry must recruit the help of historical heavyweight Teddy Roosevelt (Robin Williams) just to survive the night. Facing the possibility of losing his job and letting down his son Nick yet again, Larry must wage an incredible battle to save the museum, hoping to become at last the bold, adventurous dad he's always wanted to be. The man who's been forever waiting for his moment of greatness - just found it.